The solenoid converts the low current normally produced by the battery into the high current needed to start the engine. 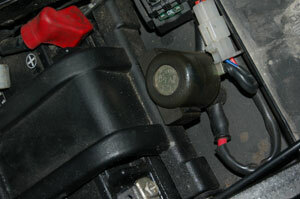 You’ll find it under your Aprilia Futura’s seat joined to the battery by a thick cable. However, when the bike’s charging system is suspect or the battery runs low for another reason, attempting to start the bike damages the solenoid, often fatally. Symptoms are (obviously) difficulty starting and sometimes the motor no longer turns over, but a rapid clicking sound comes from under the seat. “The way the solenoid works is that when you hit the starter, you power up an electro-magnet (powered by the battery) which closes the solenoid. “This directs battery power to the starter motor to start the engine. The starter motor draws a lot of amps, which is why they use a solenoid. “When the battery gets weak, the the draw of the starter motor pulls the battery voltage so low, that it cant hold the electro magnet closed anymore. “This makes the solenoid start to open, which causes some sparking, which burns the contacts, which means it doesn’t close quite as well as it used to, which increases the current draw, and the result is that the solenoid starts to burn out. A fresh battery overcomes this for a while but wont fix the fact that the solenoid’s contacts are burnt, and a fresh solenoid (with clean contacts) makes up for the battery’s lower starting voltage. In other words, the failed solenoid is a symptom of another problem – the weak battery – which in itself is often a symptom of poor charging. If you don’t address all the problems then it’s likely they will return. You can test this (if you’re very careful!) by switching the ignition on and placing a well-insulated screwdriver across the two terminals of the solenoid. There will be a lot of sparking and the bike will try and turn over. Later Aprilia Vee -twins come with 100 or 150 amp starter solenoids as standard and a new solenoid bought from Aprilia should be 150 amps*. When the stock (50 Amp) solenoid failed on my 2001-built Futura after trying to start the bike on a less than fully charged battery, I replaced it with the 150 Amp Aprilia part – Part No 8112927. The stock one looks like the one in the picture, while the replacement doesn’t have the all enclosing rubber boot. It’s actually a Hitachi item with the serial number MS5D – 191 and is also used by several other bike manufacturers at a cheaper price than what Aprilia want for it. The Yamaha part is available under part number 3UF-81940-00-00. The difference between the 50 Amp and 150 Amp solenoid is marked. Compared with its old wheezy starting (present since new) the bike spins up like it’s on steroids, which would indicate that the original was not up to the job and maybe even vulnerable to failure. But remember: You will need to check the battery and charging system to establish the cause of the solenoid. Very rarely do they go wrong on their own. *At least Aprilia claims the part is 150 Amps. There’s some controversy among owners whether it actually is 100 or 150 Amps, but that’s beside the point. The point is the replacement turns the engine faster. Thanks to Pat Mack for additional info on the solenoid.